Shaper than a Serpant's tooth... I wish you joy o'th' Worm! "We are the small voice that whispers to you in the lonely hours of the night. We call to the darkness within all of you. 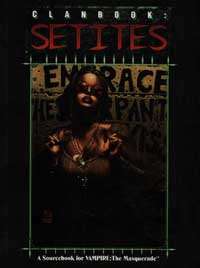 We came from the dark, and to the dark we shall all return..."
Called the corrupt by even the most crooked Ventrue, the Setites are almost universally mistrusted and feared by the clans of the Camarilla, and scorned by the Sabbat for their unwillingness to share in the Vaudalrie.